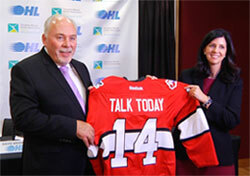 Canadian Mental Health Association (CMHA), Ontario is pleased to announce the launch of Talk Today, an exciting new partnership with the Ontario Hockey League (OHL). Talk Today has been designed for the OHL and is aimed at raising awareness about suicide and promoting the mental health of young athletes. The strength of the program lies within the network of 31 CMHA branches across the province. “Our partnership just makes sense. Each year, our branches provide mental health and addictions services, education and support to about 50,000 people, including children and youth, families and seniors. 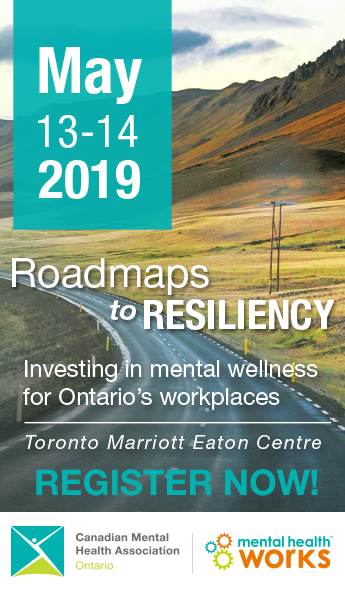 By implementing Talk Today, we’re helping to create a suicide-safer community within the OHL and reaching new audiences with a message that mental health is possible for all,” says Camille Quenneville, CEO, CMHA Ontario. Read the media coverage for the Talk Today announcement. Each participating CMHA Branch will designate a Mental Health Coach that is directly tied to a local team. This individual will provide resources and supports the players as well as the people that surround them. If a player is in need of support or if they observe a teammate in need of support, they can contact the CMHA Mental Health Coach. The coach will help provide referrals to mental health and addictions services and supports available within the local CMHA Branch or other organizations in the community. The CMHA Mental Health Coach will also help with referrals to mental health crisis intervention services, if necessary. A primary focus of Talk Today is to provide safeTALK, an accredited training program, to all players to help them be alert to persons with thoughts of suicide and learn how to take appropriate action. Evidence has shown that this training teaches individuals to look beyond the tendencies that cause people miss, dismiss or avoid the subject of suicide; identify people who have thoughts of suicide; and learn how to connect a person who has thoughts of suicide to a caregiver for intervention. CMHA will provide or facilitate ASIST an accredited training program, for individuals such as coaches, team staff or parents who provide support to the players. The training teaches people how to recognize individuals who are at risk and intervene to prevent the risk of suicidal thoughts becoming suicidal behaviors. The key to suicide prevention are trained caregivers who are ready, willing and able to get involved with each individual at risk. By offering this training, CMHA is helping establish that vital support network. In recognition of the tremendous leadership roles that members of each franchise already play within their local communities, the clubs will each name an OHL Mental Health Champion. These individuals can be players, coaches, managers, staff, parents, billeting parents or anyone else associated with the team. They will act as a resource on mental health issues and help players connect with their local CMHA Mental Health Coach. Mental Health Champions will also help promote suicide awareness and mental health within their communities. Each OHL team plays a key role in their community and supports various causes each season through creative and effective public relations events. 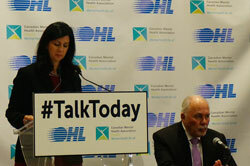 In keeping with idea, the OHL will host annual Talk Today events across the league to increase public awareness about suicide and promote mental health.